Let’s face it, this deal is going nowhere. And that means neither is Galliani. Perfect, then, that we are hosting his favorite feeder club on Saturday. He can have his choice of lower table Genoa players for only a 20% markup from his buddy Preziosi. Sure, Barbara might have something to say about it, but look what happened to her the last time she tried to do something on her own. So bring a paper and pencil, so you can jot down the names of next year’s squad. Genoa come to the San Siro on Saturday in 16th place, fresh off of their 1-0 Derby loss to Sampdoria last weekend. Their recent form is L-L-D-W-L, with the distinction of being Pescara’s singular victim this season with a 5-0 Zeman smackdown. Losing to a team owned by Massimo Ferrero is its own kind of pain, too. But will their pain be enough to inspire them to victory over what will be many of the players’ future club on Saturday? Signor Little Almonds (Mandorlini) lined up the following team vs. Sampdoria last week: Lamanna; Izzo, Munoz, Burdisso, Cofie, Ntcham, Hiljemark, Laxalt, Lazovic, Pinilla, and Simeone. He also subbed on a familiar face – Adel Taarabt. Rumor has it that the San Siro has been asked to set up a special press area exclusively for Taarabt to accommodate his narcissistic ways. Little Almonds will be missing Burdisso to suspension this time. He will also be without Orban, Ninkovic, Veloso, and Perin to injury. Starting by default... will he have 90 minutes in his legs? Meanwhile, Montella’s got a team coming off a loss so painful, Milan fans worldwide are having to be put into induced comas. 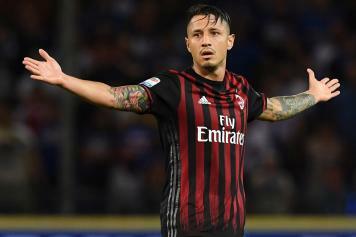 The loss saw card accumulations lead to suspensions for Romagnoli and Sosa. And it also saw Bacca suspended due to a rage that was felt around the world. Bonaventura, Suso, and Montolivo are still injured. There are conflicting reports about Abate’s fitness as of this writing. He trained this week, but some reports say his eye injury is still too serious for him to play. Both teams coming off of painful losses, but Milan’s form is much better. With both home and table advantage, one might think that this fixture is a good bet for three points. But they would be missing the bigger picture. Win, lose, or draw, our squad for next year will be on display. Make no mistake, any transfer monies Galliani can find will be promised to Preziosi by the full time whistle on Saturday. You’ll take those players at overinflated prices, and you will be grateful for them. Because Genoa. 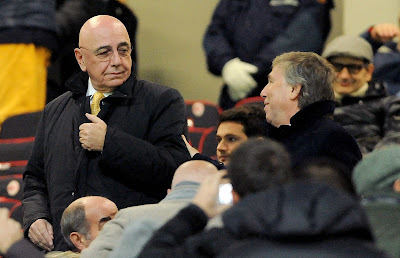 It’s Galliani’s mercato scouting.